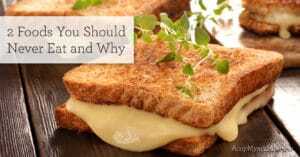 Gluten Sensitivity: Is Something You Are Eating Making You Sick? Are you eating something everyday that could be making you sick? Are you eating something everyday that could be making you sick? I was! During my second year of medical school I was diagnosed with graves disease, an autoimmune disorder that caused my thyroid to be overactive. Each night before going to bed I would eat two pieces of sprouted whole wheat toast so that I could make it through the night without losing weight. Little did I know that each night I was poisoning myself. 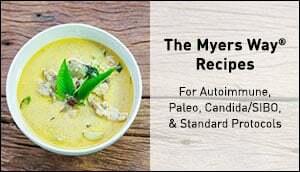 At that time, I was not aware of the gluten / autoimmune thyroid connection and my intolerance to gluten. For some, gluten can wreak havoc on the body and is the root cause of many diseases. 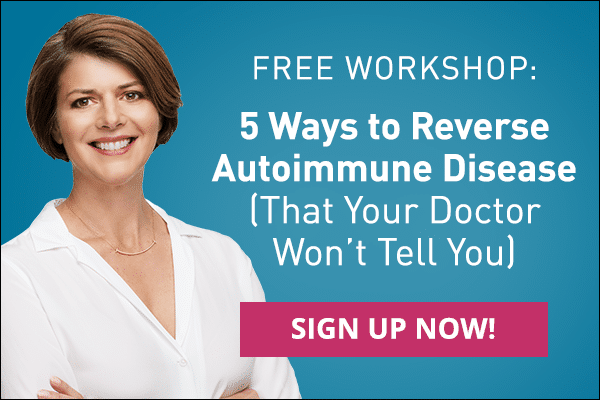 Do you or someone you know suffer from Irritable Bowel Syndrome (IBS), migraine headaches, Premenstrual Syndrome (PMS), Attention Deficit Disorder (ADD), thyroid problems, rheumatoid arthritis, osteoporosis, fatigue, weight gain, anxiety, depression or an autoimmune disease? If so, you too could have a gluten sensitivity or possibly celiac disease. More then 55 diseases have been linked to gluten. 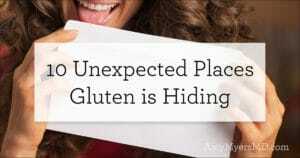 It’s estimated that 99% of the people who have either gluten intolerance or celiac disease are never diagnosed. Gluten is a protein found in many grains such as wheat, semolina, spelt, kamut, rye and barley. Oats do not inherently contain gluten, however due to cross-contamination in the processing methods, it should be assumed that oats contain gluten unless purchased as certified gluten-free. Gluten (Latin word ‘glue”) is what gives bread its airy and fluffy texture and dough it’s sticky texture. Having a gluten intolerance myself, I am hyper-aware of how many different products contain gluten.. Gluten is found in almost everything! It’s so ubiquitous that our government does not require that it be labeled on packages and it is often hidden under names such as hydrolyzed vegetable protein, modified food starch or vegetable protein. Gluten is also used as a stabilizing agent in many packaged and processed foods such as salad dressings and mayonnaise. 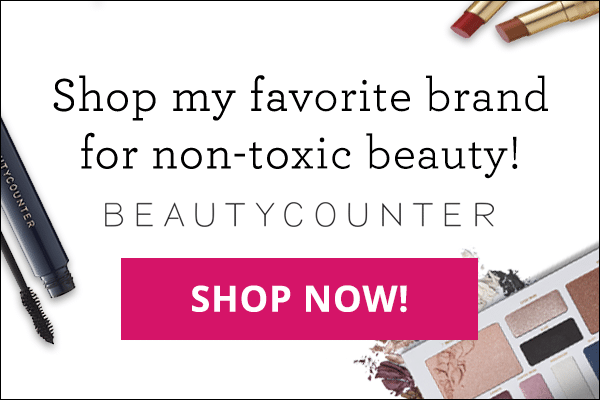 It’s in beauty products, makeup, shampoo, lotions, medications and supplements. It’s even in non self-adhesive stamps and envelopes. What is wrong with eating gluten? For some people, there is absolutely nothing wrong with eating gluten. However, for many, it is a real problem contributing to real disease. Up to 30% of those of European descent carry the genes for celiac disease, which means they are at higher risk for having health problems related to eating gluten. It is estimated that 1 in 30 people have gluten sensitivity and 1 in 200 have full-blown celiac disease. The prevalence of celiac and gluten intolerance has increased significantly over the last 50 years. One study that was published in Gastroenterology compared 10,000 blood samples from individuals 50 years ago to 10,000 people today and found that there has been a 400% increase in the incidence in celiac disease. One theory as to why there has been such a dramatic increase in celiac disease is that the wheat in the United States has been genetically modified and contains much higher amounts of gluten. By doing so, the food industry has been able to super size food and create products like extra large cinnamon buns and gigantic fluffy bagels. This may be the reason why many of my gluten sensitive patients can tolerate eating bread and pasta when traveling in Europe. European wheat has not been genetically altered and contains lower amounts of gluten than the USA version. As I have shared with you before, inflammation is the root cause to so many diseases. Both celiac and gluten sensitivity create inflammation that can affect virtually every organ system in your body. In a study that followed 30,000 patients with diagnosed celiac disease, undiagnosed celiac disease, and gluten sensitivity from 1969 to 2008, they found that each of these groups had significantly higher mortality than participants who were not affected by gluten. I have found the single best ways to determine if you have an issue with gluten is to take it out of your diet for at least 2 -3 weeks and then reintroduce it. Please note that gluten is a very large protein and it can take months and even years to clear from your system so the longer you can eliminate it from your diet before reintroducing it, the better. I’d like to mention that one potential problem with testing is that gluten is made up of several hundred peptides and gliadin is made up of 12 different sub-fractions. Most modern day testing focuses on only the alpha-gliadin (one of the twelve sub-fractions) and therefore there is considerable room for error and false negative tests. There is a new laboratory (Cyrex Lab) that has recently opened that is testing for these sub-fractions and may help to minimize false negatives. At the end of the day, I tell my patients that your body knows better than any test. If you feel better when you take gluten out of your diet or feel worse when you add it back in and you have a negative test result – you still have an issue with gluten and don’t eat it! 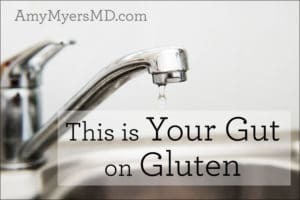 I educate my patients that though the outward manifestation of eating gluten may be mild bloating or headache, inside their body their immune system is being stimulated and the effects may last for up to several months. 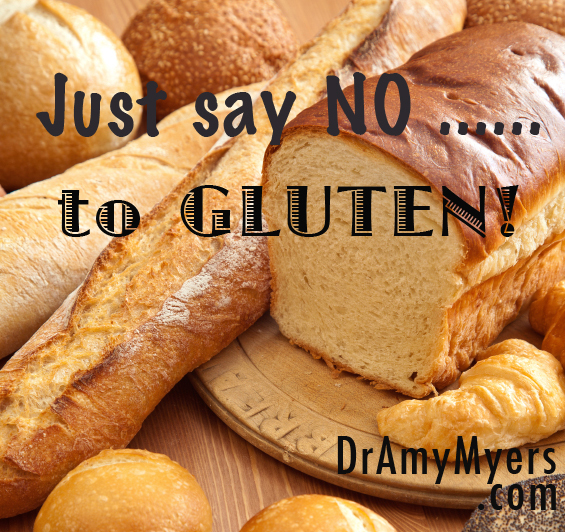 For many, simply removing 100% of gluten from their diet is not enough. The damage that has been caused to the gut lining must also be healed. Additionally, I often find that there are other infections in the gut such as parasites, Candida, bacterial overgrowth, and bacterial imbalances that need to be addressed and corrected. For some, there may be a need to go completely grain-free due to the cross-reactivity of the gliadans sub-fractions in non-gluten grains. When in doubt, go without. You are not missing any vital nutrients by not eating gluten. In fact, you may be saving your life or the life of someone you love. From my own personal experience, being gluten-free has dramatically changed my life for the better. Interested in learning more about gluten? Take our Guide to Gluten eCourse! 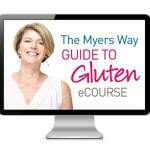 This course outlines a proven method to help you determine your own body’s reaction to gluten. Our objective is to empower you to discover how gluten affects your body and how to thrive without gluten in your diet.During the course, you will have access to a number of worksheets, shopping guides, and checklists that you can complete in the comfort of your home. The more worksheets and checklists you complete, the more helpful and effective this eCourse will be for you.The focus of this 4-hour eCourse is to provide a detailed understanding of gluten and the tools to enjoy a gluten-free lifestyle.